With two major design tours coming to LEAFHouse this fall (DesignDC - 9/25 and Greenbuild – 11/21), the board of the Potomac Valley Architecture Foundation (PVAF) has launched a much-needed exterior envelope renovation. A few years ago, foundation and chapter members visiting LEAFHouse began noticing problems with the building envelope, notably siding panels that were cracked, checked, and warped, especially on the southern exposure, some to the point of having cupped as much as an inch or more. Further investigation revealed an air gap issue that prevented the back of the cypress wood siding from drying out properly in some areas. The replacement of the building’s siding is underway, after much research and discussion, and should be completed within a few weeks. 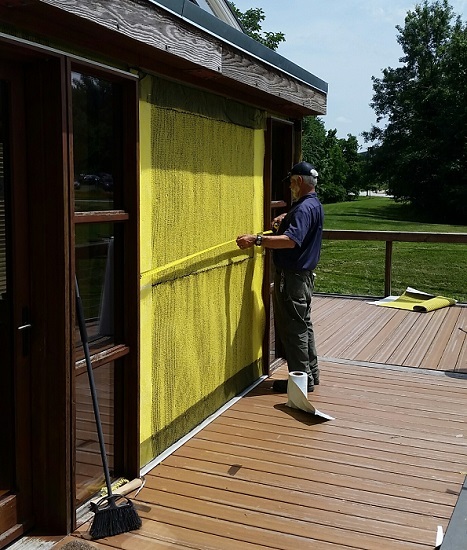 The Board chose to use a new siding material formed from compressed recycled ash in lieu of wood siding. In addition to more than 70% recycled content, this product from Boral is said to be far more resistant than wood to warping, rotting and insects. After painting, the profile will be almost identical to the original cypress panels. LEAFHouse is allowing us to make upgrades that we believe are not only cutting-edge today but will be sustainable for years to come. Too see more photos from this project and all of our other projects, check out our jobsite gallery. For more information about AIA Potomac Valley please visit their website.